Welcome back to Big Shot Sundays, I wasn’t finished using the colours from last week and wanted to add another element to the theme and these little bags are what I came up with. This project uses one of my favourite packaging item, glassine bags. 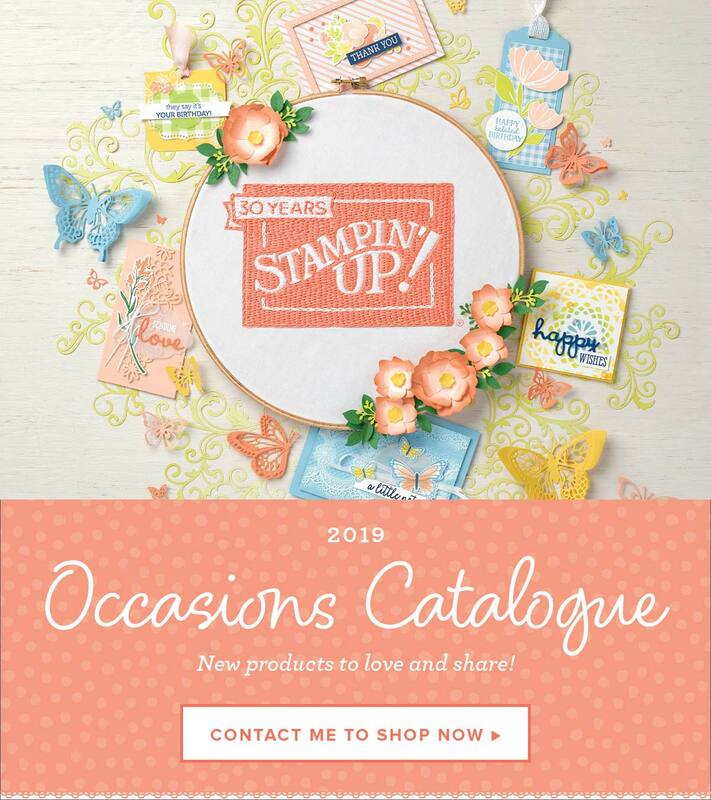 These particular bags are not Stampin’ Up! as I wanted something small and might just have a rather large stockpile of them 😉 however Stampin’ Up! does sell glassine bags as well as glassine sheets so you could make your own (check out page 175 of the catalogue). The banners were cut from one of the Mini Treat Bag Thinlits (using the Magnetic platform) but you could easily cut these on your trimmer and flag the ends (they are approx. 3 x 1-1/2″). I scored 3/4″ from one end and ran the banners through the same embossing folder as before (using the Multipurpose Platform Tab 1). I folded these over my folded bag and punched a hole through all the layers. A loop of Gold 1/8th Ribbon was knotted and threaded through to the front. I liked the idea of being able to hang these and the bags are now very easy to open, you just pull the ribbon out! The butterflies were cut using the Butterflies Thinlits (with the Precision Base Plate) and I used the Die Brush to help remove all the small pieces. I sponged the body and wing edges with the coordinating ink and covered the whole butterfly in clear Wink of Stella for some shimmer. The ferns are cut using the Botanical Builder Framelits (using the Magnetic Platform) and sponged with the coordinating ink. I added a glue dot to the back of the butterfly and created some loops using the Gold Metallic Thread, I cut one of the loops to be the antenna on the butterfly’s head. The ferns were attached to the glue dot and a strip of cut down dimensional was used to attach the butterfly firmly to the banner. When I create things like this I tend to think of how I would use them which influences their design. I thought these little bags could be used during a treasure hunt or hung on a little tree to be used as game prizes or with a small activity inside. They would also be good for portion control, especially if you have a more expensive treat. I liked the idea of being able to hang them but you could easily tie the ribbon in a bow and have them sitting wherever you wanted to use them. I’ve used several different platforms in this project and that’s because each one helps to achieve the desired result more easily than the others, but if you were starting out, the platform that comes with your Big Shot will be able to cut all of these dies. Some of the more intricate ones (like the butterfly) may require some extra work (think waxed paper and possibly shims) but the standard platform will work. (Note: there is a new Big Shot Platform that is being supplied with the Big Shot from this year, I don’t have this platform I have the older one with tabs, however it should work with all our dies). If you are thinking of buying another platform to use with your machine I would highly recommend purchasing the Magnetic Platform first, this platform is unbeatable for cutting out stamped images with the coordinating framelit and I personally use this platform for most of my die cutting. I hope you like this little variation on last weeks theme and if you have any questions regarding the Big Shot don’t hesitate to contact me, I know all the different platforms can be confusing (and expensive) but if you do purchase a Big Shot it will come with everything you need to start die cutting straight away.